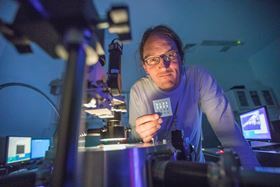 Jonathan Coleman from AMBER at Trinity College Dublin holds a transistor printed with layered materials; coupling graphene with other layered materials can lead to intelligent smart devices. Photo: AMBER, Trinity College Dublin. Graphene Flagship researchers from AMBER at Trinity College Dublin in Ireland have fabricated printed transistors consisting entirely of layered materials. Reported in a paper in Science, the team’s advance could be used for cheaply printing a range of electronic devices from solar cells to light-emitting diodes (LEDs), with applications from interactive smart food and drug labels to next-generation banknote security and e-passports. The researchers were led by Jonathan Coleman from AMBER (the Science Foundation Ireland-funded materials science research center hosted in Trinity College Dublin), in collaboration with the groups of Georg Duesberg at AMBER and Laurens Siebbeles at TU Delft in the Netherlands. They used standard printing techniques to combine graphene flakes as electrodes with tungsten diselenide and boron nitride as the channel and separator (two important parts of a transistor) to form an all-printed, all-layered materials, working transistor. All of these are flakes are just a few nanometers thick but hundreds of nanometers wide. Critically, it is the ability of flakes made from different layered materials to encompass the full range of electronic properties – conducting (in the case of graphene), insulating (boron nitride) and semiconducting (tungsten diselenide) – that allows them to produce the building blocks of electronics. While the performance of these printed layered devices cannot yet compare with advanced transistors, the team believe there is great scope for improving the performance of their printed thin-film transistors (TFTs) beyond the current state-of-the-art. All of the layered materials were printed from inks created using a liquid exfoliation method previously developed by Coleman and already licensed. Using liquid processing techniques to create the layered material inks is especially advantageous because it yields large quantities of high-quality layered materials, allowing circuitry to be printed at low cost. This story is adapted from material from the Graphene Flagship, with editorial changes made by Materials Today. The views expressed in this article do not necessarily represent those of Elsevier. Link to original source. Inks based on graphene and other two-dimensional materials enable the printing of washable and biocompatible electronics on cotton and polyester textiles. PEEK specialist Victrex has invested in a minority interest in pipe manufacturer Magma to boost the adoption of its m-pipe for subsea applications.